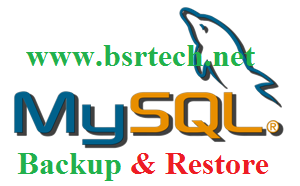 where mysql-root password is "mahesh12"
backup file name is "bsrtech_data_bkp.sql"
Verify the three databases in backup file "bsrdata_bkp.sql"
where "mahesh12" is a password of mysql root user, and take total database in /opt/ directory. using "mysqldump" command to take backup specific table in a selected database. make sure to create the "bsrtech_data" databse before you can restore the database. where "mahesh12" is a mysql-root password, "bsrtech_data" is a database, and "/opt/bsrdata_bkp.sql" is backup database.